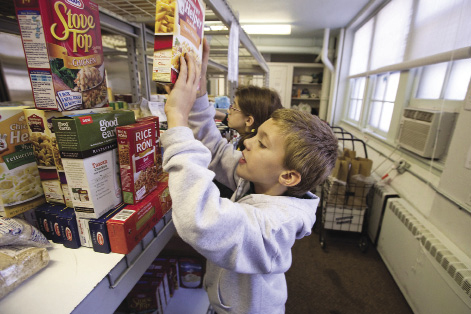 Students at Seton Catholic at All Saints learn the importance of Christian service as they stock shelves at a local food pantry. It’s lounge period at Bishop Grimes Prep in East Syracuse, NY, and four seniors — Rossella Mingolelli, Sarah Gronau, Stephen Silkey and Natalie Hoke — are, appropriately, lounging around a table on the school’s second floor. They’re relaxed, chatting and laughing, but their fingers are working hard. In their laps and on the table, they’re each winding 15 feet of string into little knots. Before too long, a familiar pattern emerges. The students are working on their service hours. At Grimes, each student is required to spend a minimum number of hours per year in service to others. The required amount increases with each grade level, and each of these seniors needs to complete 24 hours before graduation. That’s a good chunk of time to eke out, consider­ing all the writing, calculating, translating and memorizing a high school senior needs to do in order to keep up with class work. But here, service is class work, too. Since tenth grade, they’ve been spending spare moments much as they are now, twisting and looping a length of mason’s twine into knots. They’re hand-making rosaries. They started in Josephine Rabideau’s religion class, where making rosaries could be done as a project for the class. Once the project was done, making rosaries could be applied to their service hour requirements. Rabideau sees the service component as an integral part of Catholic education, especially at the high school level. Rabideau says she’s been making rosaries for years now and that she originally started thanks to fellow Grimes teacher Paul Hemsley. He had been buying the cord rosaries to send to soldiers serving in the Gulf War. Soldiers can’t carry anything metal or noisy in their pockets, which means traditional rosaries are out of the question. Hemsley thought Rabideau might like to take a shot at making the cord versions and gave her a sheet of instructions. After a false start or two, she got the hang of it and started teaching her students how to make them, as well. Rabideau says the knotting is “addictive,” and the students agree. It is not uncommon for them to be knotting in front of the TV or covertly in class. Rabideau estimates that she and the Grimes students have made at least 10,000 rosaries over the years. For these students, service has become more than just something they have to do to graduate. After all their years of Catholic education, service is now a part of their life, something they do not just because it’s their duty, but also because they actually do enjoy it. While not all schools require service hours, all encourage and support students’ participation. In the 2010-2011 school year alone, students from the diocese’s schools collectively completed more than 78,000 service hours. It’s not just service that Mominey is concerned with, however, but Christian service. Mominey also stresses the importance of giving students the opportunity to experience Christian service early on. At Seton Catholic at All Saints in Endicott, NY, the students in Anne Merritt’s third grade class are already learning what it means to serve and why it’s important. On a recent Friday, an emergency appeal went out to the school’s families from Mother Teresa’s Cupboard, the food pantry run by Catholic Charities at St. Ambrose Church down the street from the school. The pantry’s regular order of food had not gone through, which meant clients would be faced with empty shelves. By Tuesday morning, dozens of bags of food had been brought to the school. Merritt’s class was chosen to deliver the donations and stock the pantry shelves. After everyone had a turn stocking the shelves, the students declared the experience “awesome” and said it was something they’d want to do again. Principal Angela Tierno will ensure that they do have more opportunities to serve throughout their time at the school, either at the pantry or through annual holiday drives, bake sales and the school’s many other projects. Carla Nemecek, campus minister at Notre Dame Jr./Sr. High School in Utica, NY, worked to build on the service experience of the seventh and eighth graders with the school’s annual adopt-a-family project at Christmas. Though the whole school was involved, Nemecek said, “the seventh and eighth graders got into it the most.” Working with Sr. Joan Corcoran, DC, at Historic Old St. John’s Church, each religion class was paired with a family in need. Sr. Joan provided details on the family, and the students were then responsible for fulfilling their holiday wish list. There were no video games on these lists, according to Nemecek. These families needed basic necessities, like socks and gloves, laundry detergent and toothbrushes. “We discussed how the Gospel says, ‘Whatever you do for the least, you do for me.’ The project helped [the students] to see their service as an act of compassion. They put themselves in the shoes of their [assigned] family and thought about what it would be like to not have even the basics, especially at Christmas,” Nemecek said. This year, Notre Dame was able to make Christmas brighter for 16 families. The students will never know the names or recognize the faces of the people they helped, but Nemecek said that’s part of the joy of it. “These were small gestures, but they were given freely. It’s about knowing they did the right thing without expecting anything in return,” she said. The students also feel that the experience has enhanced their education. Katherine Long is the associate editor at the Catholic Sun.